Thousands of flights were cancelled Sunday, with thousands more being delayed into Monday morning as Winter Storm Bruce blanketed the Midwest with snow and whiteout conditions. The AAA projected this past weekend would see the highest travel volume in over a decade as Thanksgiving travelers returned home. When major cancellations like this occur, airport hotels become an indispensable resource for stranded passengers, offering convenience and comfort while flights are rebooked and itineraries are rescheduled. 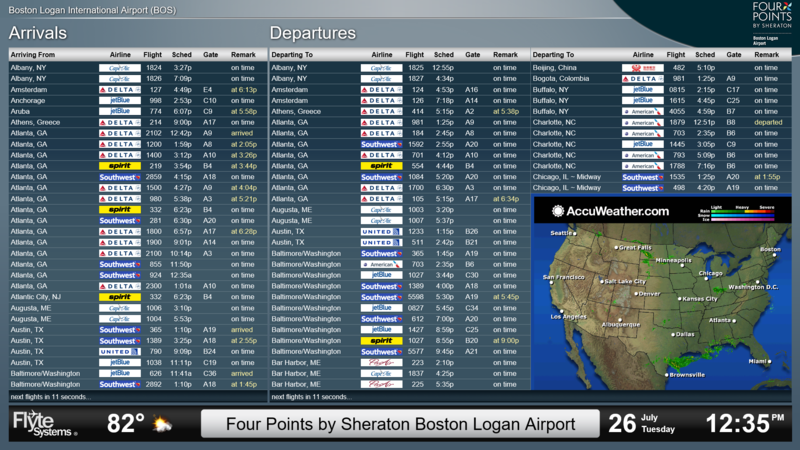 FlyteBoard with Doppler radar keeps travelers informed on flight availability and changing weather patterns. Flying can be stressful and overwhelming for travelers trying to navigate their way through an unfamiliar airport. 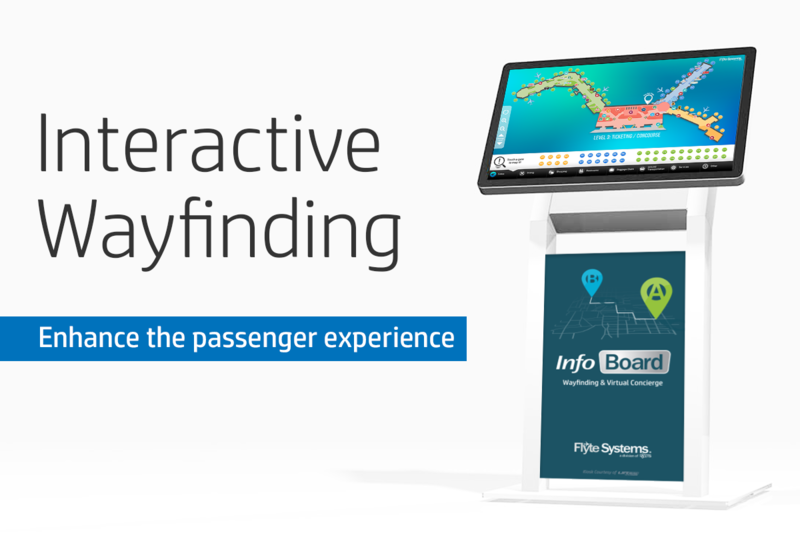 We’re here to help you enhance the passenger experience – which is why Airport Wayfinding has finally landed. 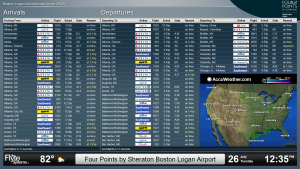 For airport hotels, having a flight screen on the premises is an invaluable resource for their traveling guests. What may not be immediately obvious are the advantages that these FlyteBoards create for the properties themselves. Take a look at how innovative hotels across the country are using Flyte Systems to boost efficiency and generate additional revenue. If a guest sees that their flight is delayed or cancelled, what’s their most convenient option? Putting yourself in that situation, would you rather (a) stay in the comfort of your hotel or (b) pass the time in a stiff airport chair? Most of us would find that (a) would be our first preference. FlyteBoard gives guests the flexibility to extend their stays without leaving the hotel – converting flight cancellations into additional bookings. Have guests wait out a delay with a good read from your gift shop and a refreshing beverage from your lobby bar. The longer the guest is on your property, the more likely they are to consume on-site services. 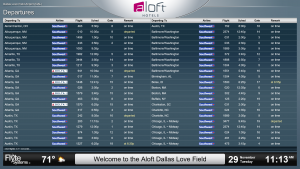 Flyte Systems® announced the new Aloft and Element Dallas Love Field hotels will provide guests with FlyteBoard digital signage airline schedule displays when they open in January 2017. 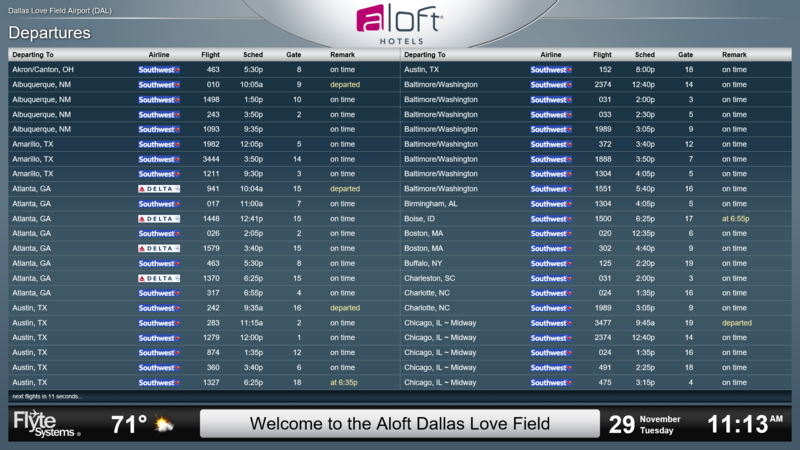 The dual-branded properties are minutes from Dallas Love Field and will have a combined total of 224 rooms. 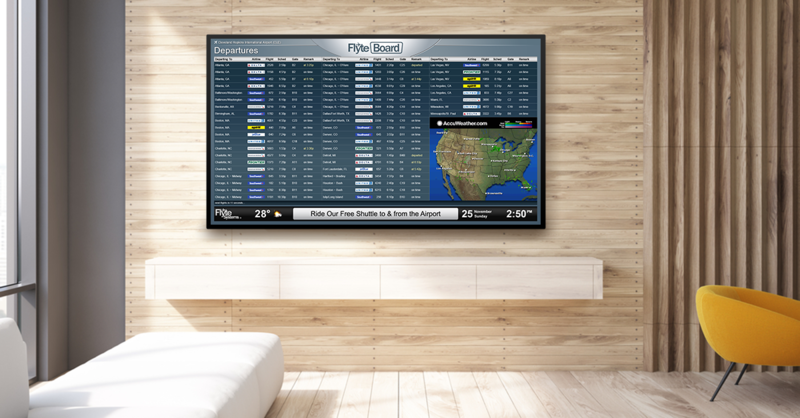 The FlyteBoard digital signage displays will show airline departures with real-time updates, gate numbers and additional information in each hotel’s lobby. “It makes sense for an airport property to provide amenities that make the guests’ journey easier,” said Randall Elmore, general manager of the Aloft and Element Dallas Love Field properties. “We understand travel today is more complex than ever. 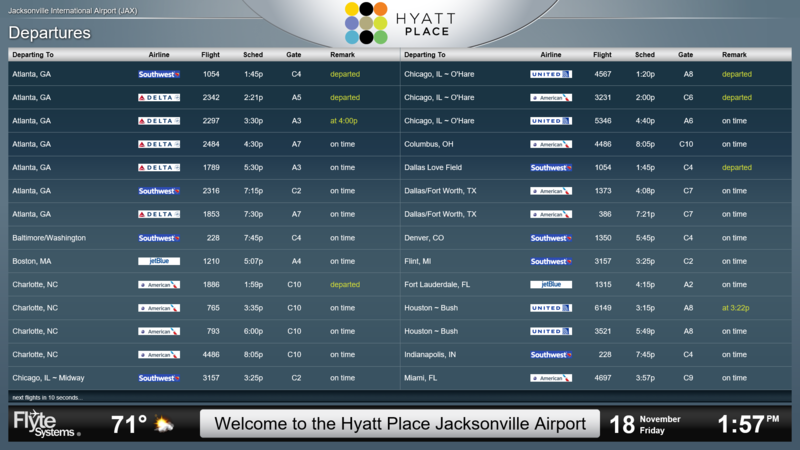 FlyteBoard looks exactly like airport digital signage flight information screens. Guests see a familiar format that is easy to understand. They can trust the real-time information and keep on track with their travel schedule.” The new dual-branded Aloft and Element concept is the first of its kind in Texas. Each property will feature its own themed format, outlets and amenities. 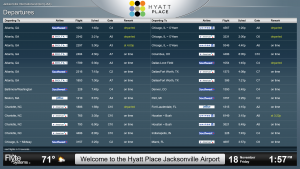 Newly renovated Hyatt Place Jacksonville Airport will include a FlyteBoard digital signage flight information display among its upgraded guest amenities. 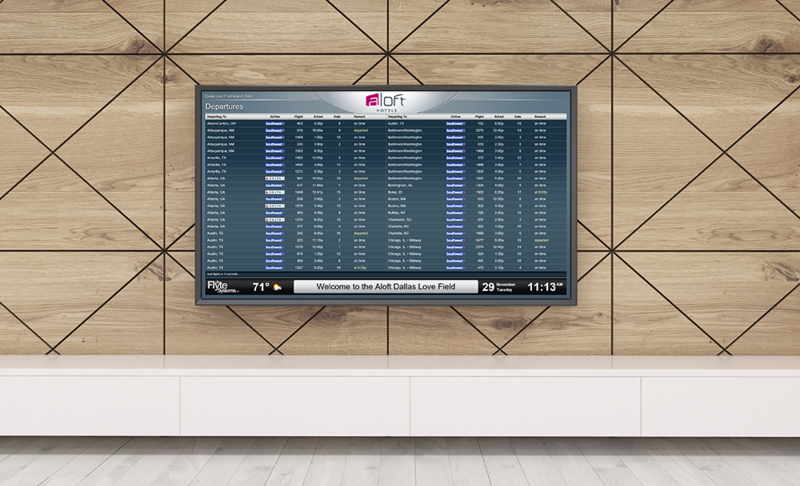 Flyte Systems’ FlyteBoard is a subscription digital signage solution that shows real-time arrivals, departures and gate information for one or more airports. The 127-room Hyatt Place Jacksonville Airport hotel is near the Jacksonville International Trade Port and close to companies that include Mercedes Benz, Coach, and BAE Systems. The property’s FlyteBoard is scheduled for installation in December 2016. Changes in signage positioning, location and content strengthen impact and value for hotel guests. Hotel guests are familiar with digital signage. It can be found nearly everywhere. If you are an operator, you probably have at least one display in your lobby. Digital signage is a good way to provide property and regional information to guests; it can even be a profit center. But, do you wonder if it is doing its job? 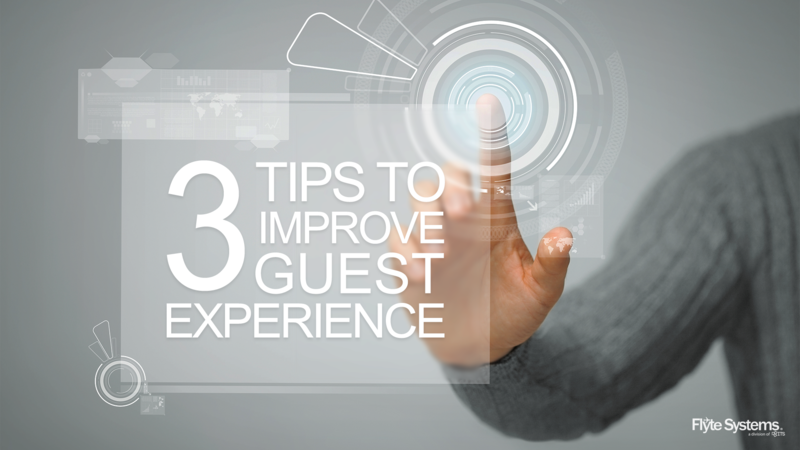 Here are three tips on how to improve your digital signage and add value to your property’s guest experience. 1. Placement is important – do guests see your message? If you want your digital signage to be effective, whether it provides property information and promotions, regional events and maps, or wayfinding, put it in a high traffic area. Placing it near the front desk where guests will see it when they check-in is ideal. Likewise, near elevators where there is a captive audience or near a concierge station or information desk. Take a day to watch the lobby guest traffic flow. This will tell you the best place to display your content. 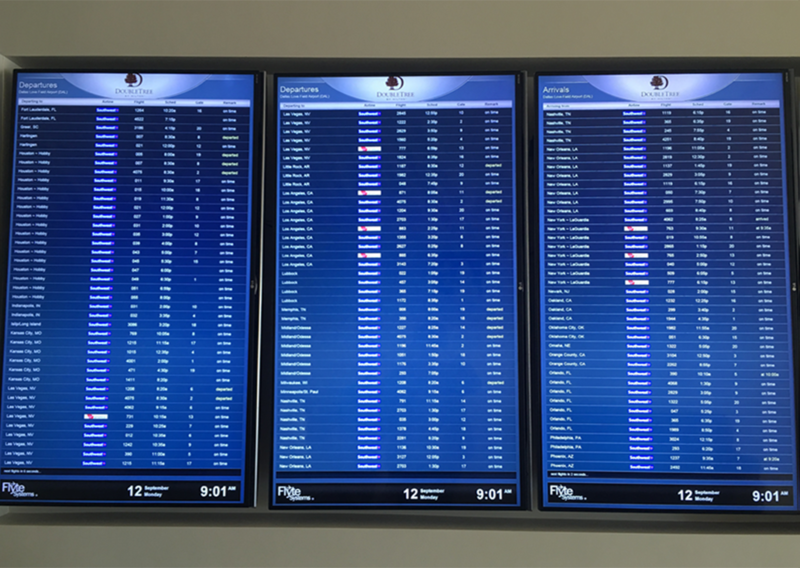 C&J Bus Lines, one of New England’s premier transportation providers, installed FlyteBoard flight information displays at three of its terminals. C&J operates scheduled intercity motorcoach services from New Hampshire and Massachusetts seacoast to Boston’s South Station, Boston Logan Airport and New York City. 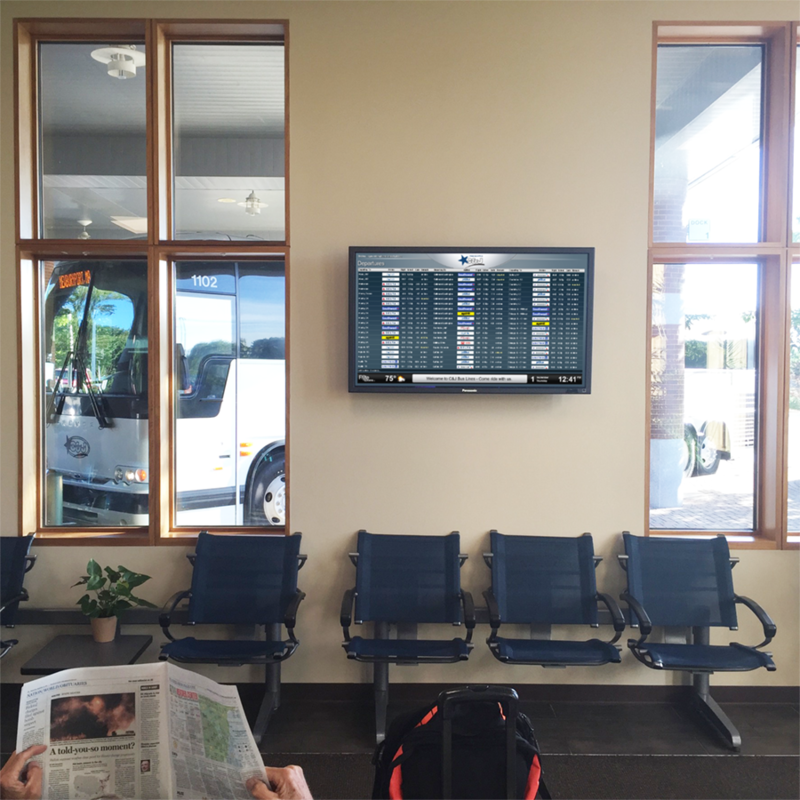 Flyte Systems is the leading provider of cost effective airport travel and flexible digital signage property information. The company delivers displays and digital signage content for hotels, corporate training centers, convention centers and related businesses. 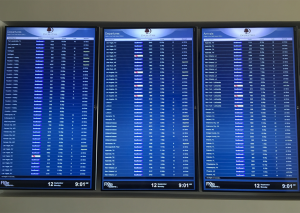 The DoubleTree by Hilton Hotel Dallas-Love Field installed three FlyteBoard flight information displays to give guests greater confidence in their travel plans. The newly renovated 244-room DoubleTree by Hilton Hotel is directly across the street from Dallas Love Field Airport (DAL). 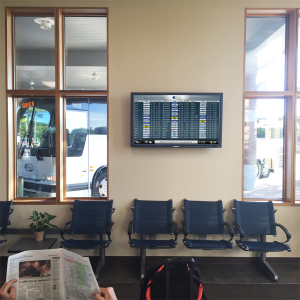 Flyte Systems is the leading provider of cost effective airport travel and flexible digital signage property information. The company delivers displays and digital signage content for hotels, corporate training centers, convention centers and related businesses. Click here to request information on Flyte Systems’ travel and guest information services.